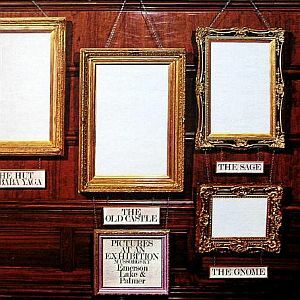 Pictures at an Exhibition is an interesting live recording released by Emerson Lake & Palmer. After having just two studio albums under their belt, ELP attempted a rock adaptation of Mussorgsky's classical piece. I'm not sure of the hows and whys of this album, like why didn't they do a studio version of this and why was not the entire Mussorgsky suite performed? That's better left for the prog academics here to analyze. What's most important is that this recording is an example of what was being experimented with in the early years of progressive rock and a true example of what ELP was like on stage. Not many bands during this time period adapted classical works into the rock format (with the exception of later disco versions), but ELP made it a tradition to do at least one per studio album. Pictures at an Exhibition is the only one to completely feature only adapted classical pieces. What catches my attention the most on this album is not necessarily how closely ELP stays true to the original, or even how well they perform it, but the raw energy of ELP performing together live. That is its most important feature. It's true that there are some technical issues. Emerson's Moog synthesizer apparently produces some wrong notes due to power supply issues and like most live recordings dating back to the early 1970s, it's not as crisp and clear as live recordings would eventually become decades later. A studio version of this song in a much shortened format was recorded and released many years later as a bonus track on In the Hot Seat in 1994. It pales in comparisons to this. Not quite a masterpiece, but a worthwhile four-star effort. A must have for any ELP fan.